The LSA Executive Committee (EC) has adopted a new Strategic Plan for the Society, covering the next five years. The plan includes a new mission statement for the LSA, along with updates to its vision, values, long-term goals, objectives and performance measures. 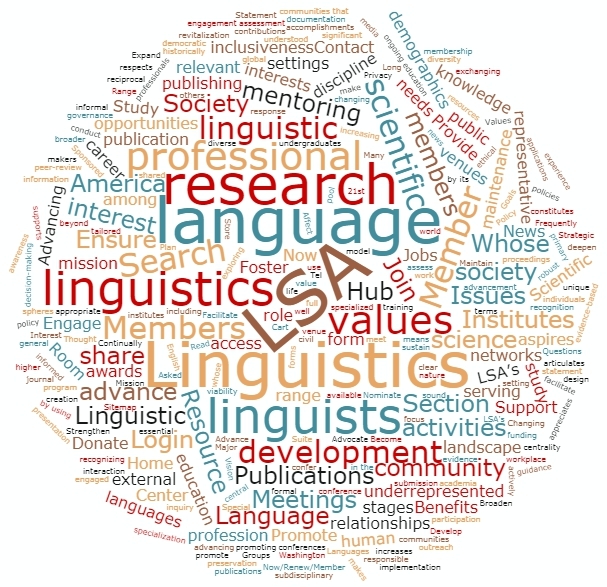 For the first time, the LSA's mission statement includes a reference to the "applications" of linguistic research, which reflects the Society's committment to be broadly inclusive of all those who share an interest in the scientific study of language. The plan was developed by an ad-hoc Strategic Planning Committee appointed by the EC in early 2018. The plan was circulated to LSA committees for review in the Fall of 2018, and those comments were considered by the EC at their meeting last month. The LSA welcomes comments from the membership about this new plan and their direct involvement in its implementation. To learn more, please contact LSA Executive Director Alyson Reed.